60 x 1000mg Veg. Caps. Propolis is hailed as a natural antibiotic with no side effects. During the past twenty years, scientific studies have 'rediscovered' propolis and found it to be a great booster of the immune system, enhancing the immune response and resistance against disease by stimulating the formation of immune cells. A recent study at Oxford University has revealed that propolis can help to cure inflammations, while Chinese research has found propolis effective in treating hypertension and arteriosclerosis, and Soviet scientists have shown that propolis can prevent ulcers. In fact, propolis is now increasingly used to treat conditions as wide-ranging as colds, sore throats, coughs, allergies, vaginal infections, painful menstruation, acne and herpes. 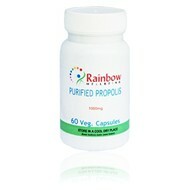 Purified Propolis equivalent to 1000mg of raw propolis per capsule and wild flower bee Pollen + vegetable capsule shell. No other Ingredient or additive of any kind.